A pink, neon-lit motel room nestles in a foreshortened cube on a stage. A blonde-wigged woman, Virginia, waits patiently. A selected but unrehearsed male member of the public enters the set as Marty, her husband, and plays a scene with her. It’s a domestic, verbal war of minute dramatic shifts and long-simmering resentments: the couple argue, they dance. Virginia demands her partner’s compassion and Marty brickwalls her. The scene lasts around three to six minutes, depending on how the pair interact. Two camera operators capture the action in six shots and a projector beams their live edits onto a screen beside the set. Marty has been given a script beforehand and one crucial moment of agency: to vary his final line of dialogue, choosing between “I love you” and “I never loved you.” Virginia hands him $50 (his fee for performing), he departs, and the loop starts anew with a new audience member. 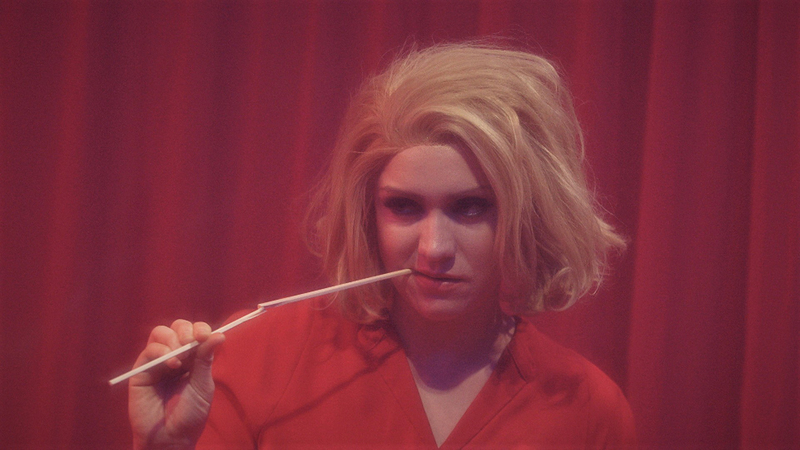 This is The Second Woman, in which Sydney artist Nat Randall invites 100 men to act opposite her in a scene from John Cassavetes’ Opening Night, replayed live over 24 hours. The 1977 drama featured Cassavetes’ real-life partner, Gena Rowlands, as Myrtle, an ageing stage actress cast as Virginia in a play about what she calls “the gradual lessening of my power as a woman as I mature.” Myrtle is worn, alone, drinking heavily but stoic in her devotion to her character and the play, and the film, described by scholar George Kouvaros as a story about “the figure of the female performer in crisis,”, continually violates the boundaries between on-stage, on-screen and real life. The Second Woman continues Randall’s trajectory of making risk-taking and experimental work since graduating from the University of Wollongong in 2008 and working with live performance groups Hissy Fit and Team MESS. Randall performed The Second Woman at 2016 Next Wave Festival and at Dark MOFO this year (read Briony Kidd’s review). I spoke with her and collaborator, filmmaker and dramaturg Anna Breckon as they prepared for the work’s third outing at Performance Space’s Liveworks Festival of Experimental Art in October. “It began with our interest in multiple levels of performance,” says Breckon of the project’s evolution, citing Opening Night’s “trickiness” as a film, and its many reference points to Hollywood backstage dramas and 1950s melodramas like All About Eve. Having dealt with the bureaucratic hurdles involved in staging a round-the-clock performance in Sydney — Carriageworks’ venue licence had to be modified to allow 24-hour operation, which was only approved by the council the week of the Liveworks program’s launch — the pair are now free to focus on “opening up” Randall’s performance. Myrtle’s defining struggle in Opening Night is also to stay present against the lock of habit and the slope of indifference. She says, “When I was 17 I could do anything. It was so easy. My emotions were so close to the surface. I’m finding it harder and harder to stay in touch.” Perhaps the relationship between Opening Night and The Second Woman is growing closer as the latter evolves across its iterations. The surprising element for Randall has been the blurring of a stream of different men into a single man. The memory of one Marty to the next passes across performances: the many iterations of the male character merge into one and slide from scene to scene interchangeably. What emerges from the format of a repeated script is a passage, made deeper and wider in each restaging, in which a single male character is rewritten along fairly similar lines by a succession of non-actors, who tend to perform learned and stereotypically alpha-male behaviour. It’s that fastened positioning between Randall and her procession of onstage counter-agents that the pair are now working to revitalise as Liveworks approaches. Contemporary art in Australia has taken a distinct postgraduate turn in recent years, with artists increasingly making work within Masters and PhD programs under the banner of creative research. Since her undergraduate days at the University of Wollongong — which has a reputation for producing inventive live art practitioners like Malcolm Whitaker, Dara Gill and the Team MESS, re:group and Applespiel collectives — Randall has forged a divergent path by primarily participating in residencies and festivals. Her practice has been founded on constantly and collaboratively devising work with other artists and curators — and, ultimately, audience members. While everyday performativity is central to John Cassavetes’ films, a broader iteration of it comes into view in The Second Woman where repetition, duration and video-framing push cinema into a large-scale live art framework. Anna Breckon brings her knowledge of cinema to the partnership, while Nat Randall brings the participatory and durational components. “I don’t know how to make work by myself. It’s always collaborative,” she says, and the audience completes that collaborative circuit. NOTE: Tickets are $15 and available on the door only. Ticketholders receive a wristband allowing them to enter and exit the theatre over the 24 hours until the theatre reaches full capacity.